Described by Jeremy Clarkson as 'achingly good-looking', the Morgan Aero 8 revisits the golden era of British motoring with its classic curves and styling, and features all the luxurious leather and chrome . It's more than just a showpiece though, as while it may be a visual throwback, it's state of the art under the hood, boasting a roaring V8 and all-aluminium chassis. 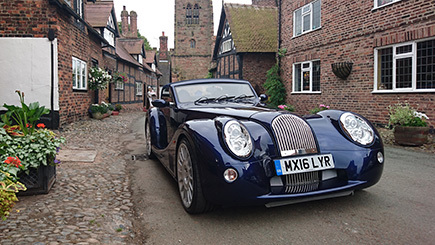 Sit in this head turner for an incredible 150 miles, and discover just how unique driving this perfect blend of timeless and high-tech British motoring is. And should the weather allow it, roll down the top and feel the breeze as well as the envious stares of other drivers. Warning: this experience will render commuter car driving unbearable by comparison. Monday - Thursday throughout the year. Vehicles can be collected from either a London or a Hertfordshire venue free of charge. Delivery can be arranged at additional cost (for which you will need to liaise directly). Drivers 30 - 65 years only. Full manual driving licence, held for a minimum of two years required, with fewer than 6 points. A credit/debit card deposit of £5000 is required on collection. You will have the car for 24 hours. The car will be available for collection from 9am on the chosen weekday and must be returned by 9am the following day. You will be charged a per mile rate if you exceed the allocated mileage for your vehicle. An additional driver can be added for £17.65, subject to the insurer's approval (for which you will need to liaise directly).